Wilderness training at our Survival Schools in San Diego, California and Africa are not only fun and fulfilling but welcome all experience levels. Our field tested experience, small groups, and spectacular locations are what sets us apart when it comes to real life survival skills that you can count on - military, celebrities, scouts and more have chosen to train with us for this reason. If you do not walk away feeling more competent in the outdoors after training with us, then we will give you a full refund! Watch a short video of how we train you! 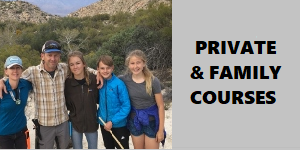 We lead global survival wilderness courses in spectacular outdoor locations throughout southern California - San Diego, Orange County/Los Angeles and Africa. Our focus is on connection with the land and working with it using the natural resources as our ancestors did and using less man made gear. Primitive skills are empowering as they provide the platform to be truly self sufficient in the wild. Join us to experience quality survival training, beautiful wilderness terrain and adventure! Many of our survival training courses are lead in southern California and Africa - learn more about all our Survival Schools across the globe and start planning your next adventure!